Ever since I got back to San Francisco from my trip to LA last weekend I feel like I hit the ground running and haven’t stopped. Between unpacking, cleaning, grocery shopping, half-marathon training, assignments, quizzes, a presentation, and a paper (which I still need to get done tonight), I have had no time to myself! 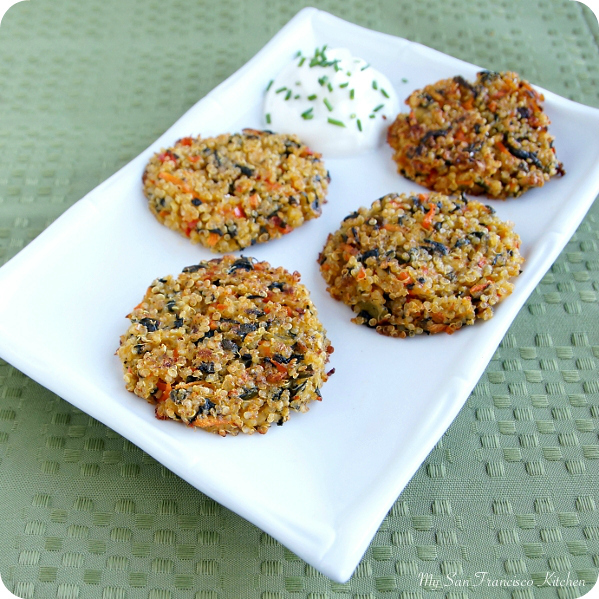 I still have a lot to do tonight, but I just had to share these delicious veggie quinoa cakes with you. The story behind these quinoa cakes? Well, when I got back from my trip this weekend, I opened the refrigerator to find the very same vegetables I left my husband to cook with 5 days before staring back at me (cooking is not one of his passions). I was craving quinoa for lunch, and voila! 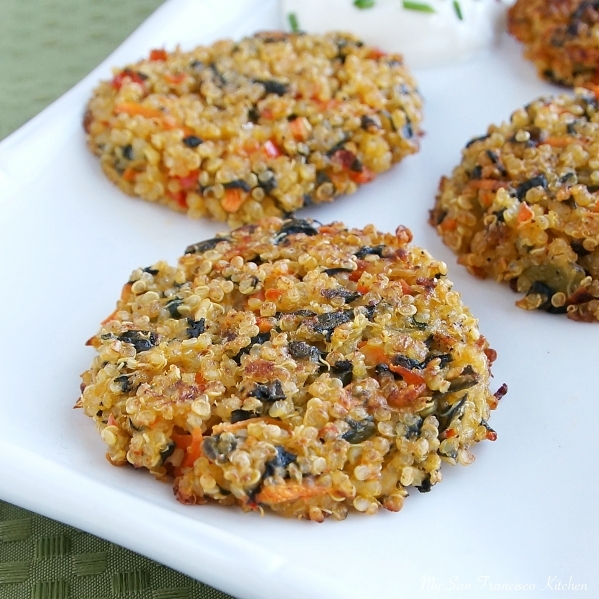 the idea of vegetable quinoa cakes was born. 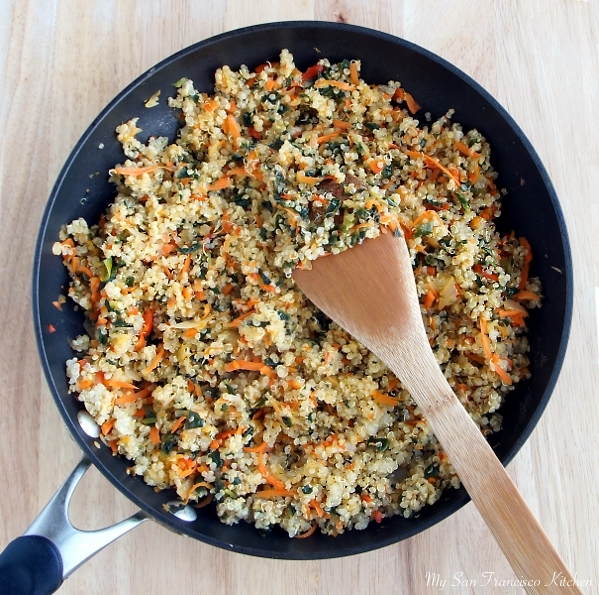 A little bit of onion, carrots, red bell pepper, spinach, garlic with a pinch of salt and pepper mixed with quinoa and eggs make a great appetizer or side dish. I love that quinoa is a healthier grain (ok, so it isn’t technically a grain) than rice, because it has more healthy fats and is considered one of the best non-animal protein sources you can eat! When I cook vegetarian/vegan dishes, I always try to include quinoa because it adds important amino acids to your diet that many other vegetarian foods lack. I decided to leave breadcrumbs out, but I think they would make a great addition to this basic recipe. The possibilities are endless when it comes to which vegetables to add – you can play around with different flavors. These do take some time and effort, but they are so worth it! I love serving them with sour cream; since they are a cake, they are on the dry side. Note: These are soft cakes, not crispy – only the outer edges are crispy from browning in the pan! 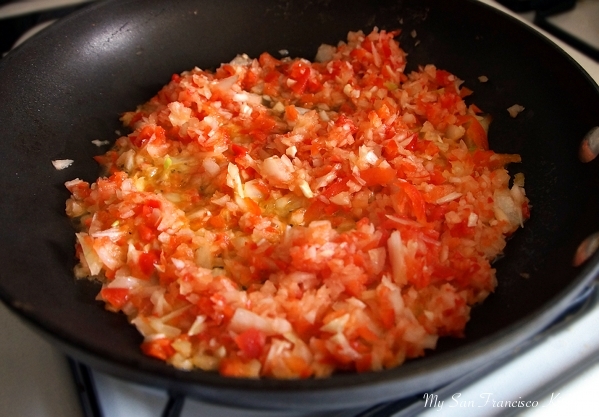 In a food processor, finely chop onion, garlic and red bell pepper. Add chopped onion, garlic and red bell pepper and sauté for 7 minutes, stirring occasionally. In the food processor, shred the carrot and transfer to the skillet. 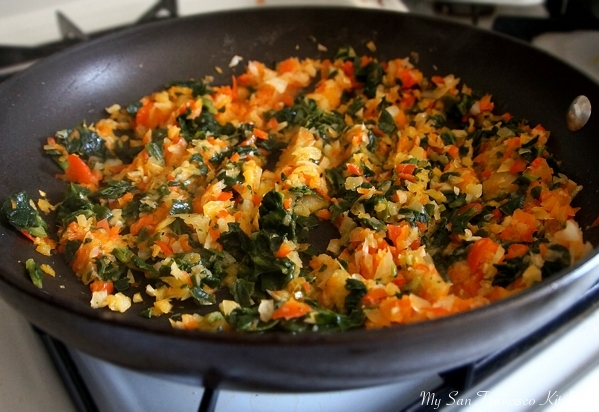 Add the spinach and stir well. Add the quinoa, salt and pepper and stir well and remove from heat. Beat two eggs in a small bowl and add to the cooled quinoa mixture. Mix well with a wooden spoon until completely coated in egg. In another skillet, heat a small amount of olive oil over medium-high heat. 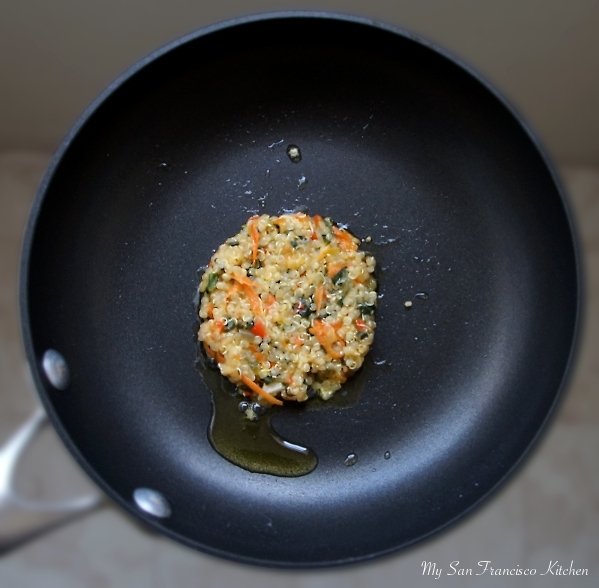 Use your hands to form a golf-ball sized ball of the quinoa mixture and set onto the skillet. Press down with the back of the wooden spoon to flatten. Cook for 3 minutes, until the bottom turns golden brown, then flip and brown the other side. This will help keep them together, so don't skip this step! Repeat until all of the quinoa mixture is used up. Transfer to a greased baking sheet, placing them 1 inch apart. Serve warm with sour cream or other topping. This entry was posted in Appetizers, Lunch, Organic, Sides, Snack, Vegetarian and tagged bell pepper, carrots, garlic, olive oil, onion, quinoa. These are so perfect!! I love quinoa and i have always wanted to make them in a cake form. I’m going to give this a go this weekend!! These look wonderful, great color and texture! I’m not someone who eats quinoa often, and this recipe really makes me want to give it another go because I love all kinds of cakes like these that are packing good veggies AND grains. Best of luck knocking out all your to-dos! … What half marathon are you training for? These look great! I’ve been putting quinoa in everything from soup to granola to cookies lately. My favorite way to eat it is in cakes like these, though. I’ll definitely be giving this recipe a try! Great looking impromptu meal idea! 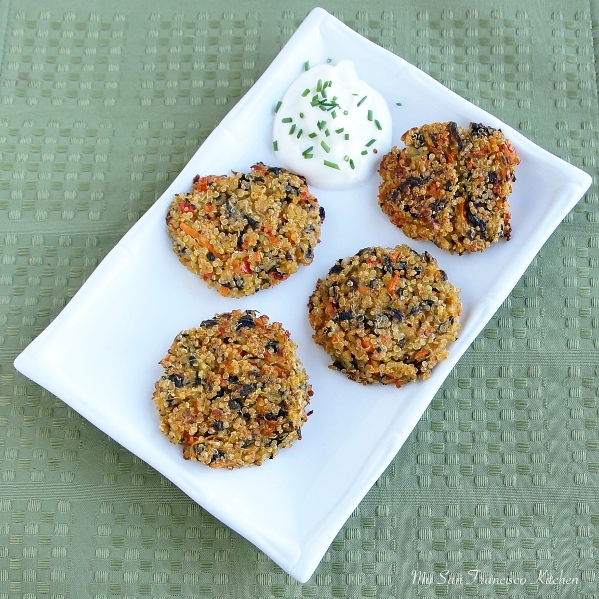 These quinoa patties with veggies look right up my alley! Just wanted to say that what caught my eye about your blog is that you blog from SF (I do too!). How would you replace the eggs? I am a “Newbie Vegan”, so any help would be appreciated & this protein look soooo good.